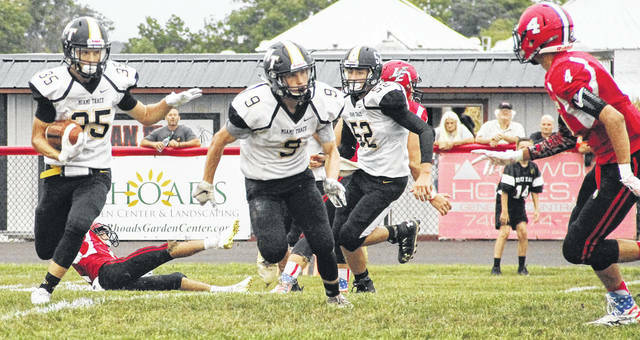 Miami Trace’s Caden Sweitzer (35) returns a punt during a non-conference game at Logan Elm High School Friday, Sept. 7, 2018. Also pictured for the Panthers are Joshua Gilmore (9) and Luke Henry (52). CIRCLEVILLE — Miami Trace posted its second win over a Pickaway County opponent in three weeks on Friday with a 22-9 non-league win over host Logan Elm. The Panthers (2-1) cashed in their opening drive when Justin Shoemaker booted a 27-yard field goal to make it 3-0. Miami Trace scored on two-straight possessions in the second quarter to extend its lead to 16-0. Caden Sweitzer scored from 12 yards out to make it 10-0, following the extra point by Shoemaker. The Panthers added to their advantage when Dalton Mayer hauled in a 64-yard strike from Tyler Taylor. The two teams had to endure a longer halftime than normal due to a lightning delay. When play resumed, the Braves eventually reached the scoreboard on a 34-yard keeper by Conner Robinson. The two-run conversion run failed, leaving Miami Trace with a 16-6 lead. The Braves trimmed their deficit to 16-9 on a 30-yard field goal by Hamid Sharif with 61 seconds remaining in the third quarter. But that’s the closest the Braves would come, as Jayden LeBeau intercepted a last second pass and returned it for a touchdown to make the final 22-9. The Braves actually outgained the Panthers 317-188, but were hurt by a pair of turnovers in the defeat. Robinson completed 18 of 37 passes for 243 yards. Tyler Arledge made five receptions for 86 yards, Logan Watson accounted for six grabs for 60 yards and Chase Hoffman added four receptions for 45 yards. Taylor rushed for 59 yards on 10 carries for the Panthers and completed 3 of 13 passes for 86 yards. Miami Trace (2-1) is at Clinton-Massie next week to take on the Falcons. The Braves (0-3) open Mid-State League Buckeye Division play next week at Amanda-Clearcreek (3-0).